ClickFunnels 100 Days Affiliate Bootcamp Review - Is It Worth It? ClickFunnels 100 Days Affiliate Bootcamp Review – Is It Worth It? In this video, I wanted to give you a short review of the ClickFunnels 100 Affiliate Bootcamp. It’s basically a 100 day training program that helps you build your affiliate marketing skills and teaches you how to sell products online. In truth though, the training itself is only 65 days, and the other 35 days is for you to go out and apply the 10 day method to other products you want to promote. I even mentioned in a previous video a few months back that I wished I had started this earlier, since you only get 1 new lesson opened up per day. So better to start now and wait for the days to pass by while you are doing other things. This 100 Day Affiliate Bootcamp is also 100% free, so you don’t have to worry about someone trying to cheat you out of your money – there is absolutely no monetary investment required and the only motivation for ClickFunnels to offer this training is so that you can sell their products for them to get more money… but you do not HAVE to sell and promote ClickFunnels products and can use the knowledge gained here to sell anything at all that you want. Well, this 100 Day Affiliate Bootcamp contains all the information that I covered in those videos… They don’t really hold anything back and show you as much as possible so that you can start making money for yourself and for ClickFunnels. The cool thing about this Bootcamp is that you are given a video for each training session, usually of a seminar by Russell Brunson, and then followed by a quick review video from Kevin Tija, the ClickFunnels affiliate manager to ‘translate’ what you just saw in the video to ensure that you understand what is going on. I would definitely recommend this 100 Day Affiliate Bootcamp to everyone as you will gain a ton of new knowledge and insight that is used by Russell Brunson and lots of other successful entrepreneurs worldwide. 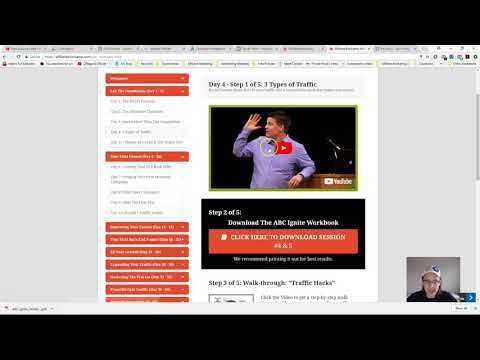 I gave an example in the video of Dan Henry using the techniques used in this Bootcamp to propel his website and career to success as well. You can check out his site at www.danhenry.org to see what your site should roughly look like. Thanks for watching, and I’ll see you in the next video! ClickFunnels Review – Is it Still Worth it in 2019? ©2018 ClickFunnels Review. All Rights Reserved.